The Ecole de Guerre trains officers to become the next generation of the armed forces’ top brass. The partnership marks the first time the French military has worked with a non-profit on adapting to climate change, said Nathaniel Powell, an expert on the French army in Africa at the Lausanne-based Pierre du Bois Foundation for Current History. The venture seeks to study the ability of conflict areas to withstand the pressures of a changing climate as the planet warms, said Marine Braud, head of green diplomacy for WWF France, at a conference held alongside U.N. climate talks. “We work together on the links between environment and security,” she told a panel discussion. The partnership, which kicked off in September, involves about 40 officers at the Ecole de Guerre, representing about a fifth of the school’s students. It will focus at first on West Africa’s Sahel region, said Braud, where the alliance hopes to carry out its first “stress test” exercise next year. The results will be released in a report, she said. France has maintained a large military presence in the Sahel, one of the poorest parts of the world with a rapidly growing population that has been hit hard by climate change. The French armed forces drove out a mix of Tuareg separatists and Islamist rebels from northern Mali in 2013, and now deploy 4,500 troops in Mauritania, Mali, Burkina Faso, Niger and Chad, according to the defense ministry. WWF France’s head, Pascal Canfin, referred to climate change as a “threat multiplier” while speaking to lawmakers at the French National Assembly last month about the group’s partnership with the military. Tags: Climate change, France, French military, Nathaniel Powell, national security threat, UN climate talks, WWF. The Great Awakening has begun across the globe. 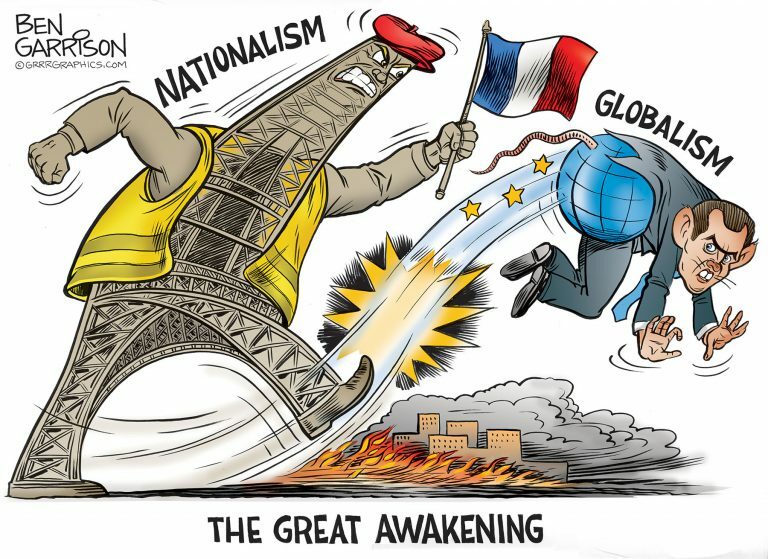 The entire world is waking up and realizing that the false siren song of Globalism is truly false.